от 5 шт. — 5 900 руб. от 10 шт. — 4 720 руб. Добавить в корзину 1 шт. на сумму 6 340 руб. The A2175-HBL TC.R GN is an A2175-series 240VAC Axial Fan, reliable shaded-pole motor, thermal protected and class-B motor protection. 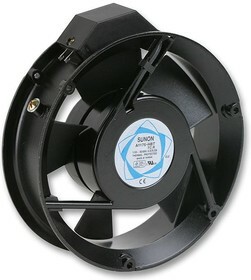 Air performance measured by a double chamber, the values are recorded when the fan speed has stabilised at rated voltage. ±15% tolerance on rated power and current. High speed with ball bearing, wire leaded power connection with 0.11A power current and clockwise direction of rotation viewed from front of fan blade.